Extracting dye from mistletoe and its host (in this case eucalypt and casurina) in order to screenprint and dye fabric formed the starting point of this work. From here a three-in-one garment was constructed, each wearer connected to the next via the sleeves. Once inside the garment the wearers no longer have full control or autonomy of their movements. If one wishes to move in a particular direction the co-operation of her fellow wearers must be garnered, while certain movements are no longer possible within the constraints of the garment. Where does this leave the wearer, is this a space of frustration or possibility? How are one’s actions affected by and effecting the environment and others? Through this three-in-one garment a heightened dependence and interconnectedness is articulated – which, while delimiting possibilities, is not necessarily a negative constraint. Rebecca Mayo is a Melbourne based visual artist whose print practice engages with memory, gender and ecology. 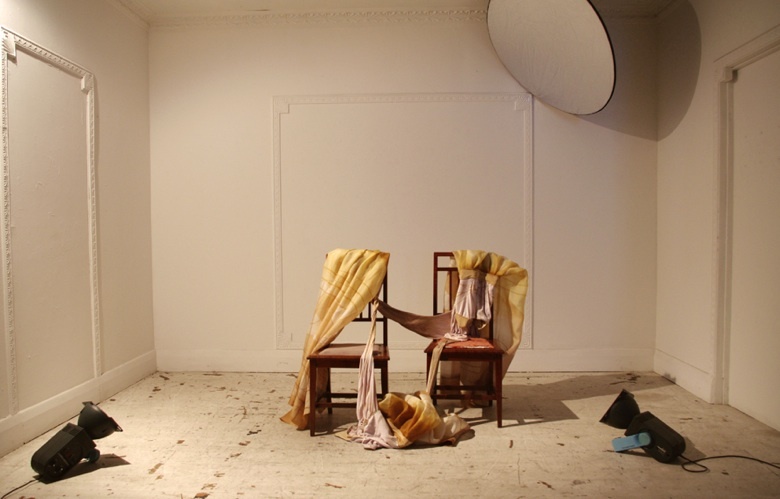 Her recent work explores the relationship between performance and memory. Since 2000 she has taught screenprinting at RMIT University in the School of Art. She has curated the Dolls House, a not-for-profit space in the shop window of her screenprinting studio in Preston for over six years. In addition to her own practice she has screenprinted the work of a number of Australian artists including Melinda Harper, Darren Wardle, Rona Green and John Nixon. Her work is held in numerous collections including Art Bank, Little Creatures Brewery’s Little Collection and the National Gallery of Australia.